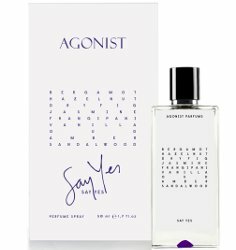 Swedish niche line Agonist Parfums has launched Say Yes, a new unisex perfume. The notes include bergamot, hazelnut, fig, jasmine, frangipani, vanilla, oud, amber and sandalwood. I agree. I tend to like their line in general. Silly ad copy. Hope it’s not too sweet! It does sound good. I have missed their last handful so I can’t say if I like their line in general.